The two boxers grin as they touch gloves, an acknowledgement of their shared journey. One small in stature, the other a giant, the pair have much in common - the shared weight of pressure and expectation, the shared joy of success, the shared expectation of what their futures hold. The man in the golden gloves, the featherweight, is dripping with sweat. There is a single mark under one eye. The only signs of the past 26 or so minutes of activity. His job for the evening is done. The heavyweight's work is yet to begin as he pumps his red and black gloves onto the gold ones. No words are spoken. Underneath the hooded gown, stretched over his huge physique, the big man is instantly recognisable as Olympic champion Anthony Joshua, the next big thing in boxing. As Joshua leaves the backstage area of The O2, his entrance music pumping over the arena speakers, Lee Selby struts contentedly back into his changing room. The 27-year-old Welshman does not have the gold from London 2012. You may not know his name, yet. But along with his giant contemporary he is set to be a major player in the future of British boxing. 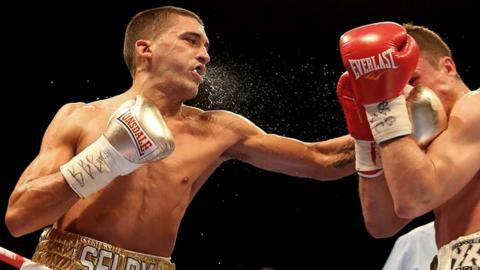 Four years ago Selby won the Welsh featherweight title at the Newport Centre in South Wales. He had already lost one of his previous eight contests. "I do like to prove people wrong, to show them I can be the best featherweight in the world." "I can count on my fingers the number of days I've had off, out of the gym, over the past four years," says the boy from Barry as his sits down on the armchair in his dressing room. "And it's all gone into what you've seen out there. Next step is the world title fight." He grins again, his gold tooth matching the gloves and the tassels on his shining white shorts and box-fresh boots. "Out there" was the boxing ring at the centre of the O2 Arena in London, where for nine rounds the tassels flew in the air as Selby performed a master class on the way to a stoppage win over Joel Brunker. Lee Selby has won Welsh, Celtic, British, European and Commonwealth title on his way to a shot at the world crown. "I never got near to top gear. You should see me sparring in the gym - that's when I hit my top form. That was second or third gear," says Selby. The Welshman speaks with a confidence backed up by a career high performance against "Aussie" Brunker. Alongside the self assuredness, his 20th professional victory has brought with it number one contender status for the IBF version of the world featherweight title currently held by Russian Evgeny Gradovich. Despite the self belief, Selby takes note of those who say he has cruised in fights, that he needed a stoppage to convince the muted crowds that he is for real. "I wanted to put on a show, to shut up a few of the critics," he said. "It's not that I felt the pressure to perform but I do like to prove people wrong, to show them I can be the best featherweight in the world." The gold tooth reappears as the smile returns to his face and he adds: "I'm not far away now, I'm the mandatory challenger for the IBF title and I've got here the hard way, the old-fashioned way. "Four years of hard work in the gym, winning the Welsh, the Celtic, the British, the Commonwealth and the European titles. And here we are. One step away from glory." A huge cheer thunders down the corridors of the arena. The colossus is victorious. "Sounds like 'Josh' has done his job too." Selby stands up to shower before he congratulates the new poster boy of British boxing. As he packs his overstated clothing into his St Joseph's boxing club kitbag, he knows Joshua will dominate the headlines he reads as he heads back to South Wales on the Megabus. Heavyweights cast long shadows, but in 2015 the little Welshman hopes to share the spotlight on the world stage.